Powerful grooving lineup with integral-style, SwitchBlade-style, face grooving style, and Cut-Off Style toolholders for various grooving applications. Smooth chip control with a high precision edge preparation and MEGACOAT coating for long tool life and high efficiency machining. 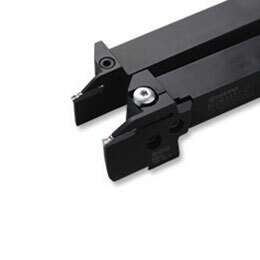 Featuring Integral-style, SwitchBlade-style, Face Grooving style, and Cut-Off style toolholders for various grooving applications. Excellent chip control due to the new PF & PQ chipbreakers with improved insert clamping force generated by an innovative toolholder design.